May 1, 1942: Filming on For Me And My Gal continued with scenes on the “Interior Jo’s Hotel Room/Interior Harry’s Room” set. Time called: 10 a.m.; dismissed: 5:55 p.m.
May 1, 1947: The Pirate filming continued with scenes on the “Exterior Don Pedro’s House” set which was actually the “Verona Square” set on MGM’s Backlot #2 (originally constructed for the 1936 adaptation of Romeo and Juliet). Time called: 10:30 a.m.; dismissed: 2:10 p.m. 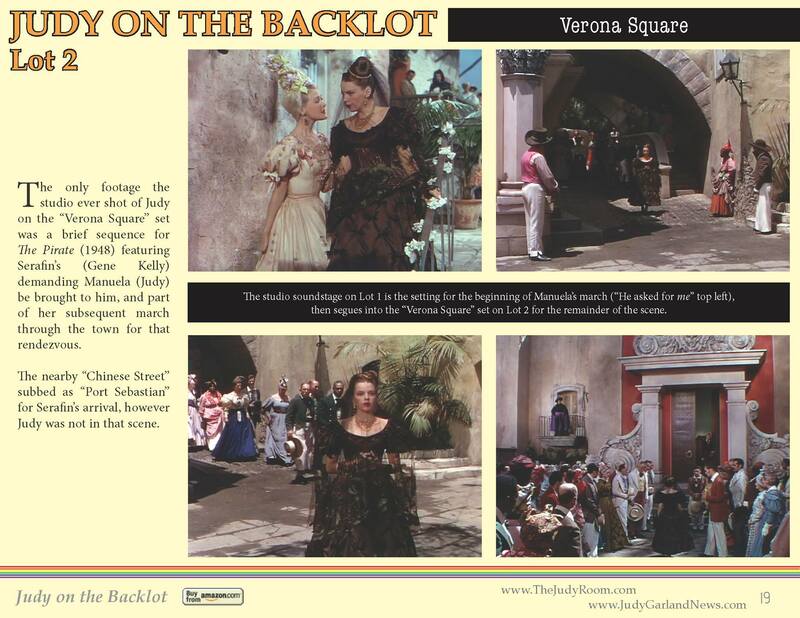 The image above is a page from the “Garlands for Judy” article “Judy on the Backlot” [link is to the PDF of the article] which goes into detail about MGM’s famous backlot and where on that backlot scenes in Judy’s movies were filmed. Also be sure to check out The Judy Room’s Filmography Pages on The Pirate here. 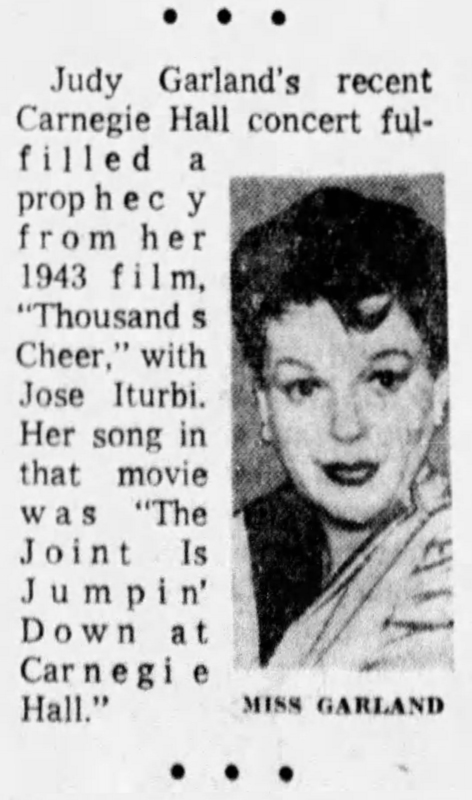 May 1, 1953: This great photo (see below) of Judy accompanied this article about Judy’s success opening the Blue Grass Festival the previous night at the Memorial Coliseum in Lexington, Kentucky. The photo was one of many taken during Judy’s visit to the local Shriner’s Children’s Hospital. 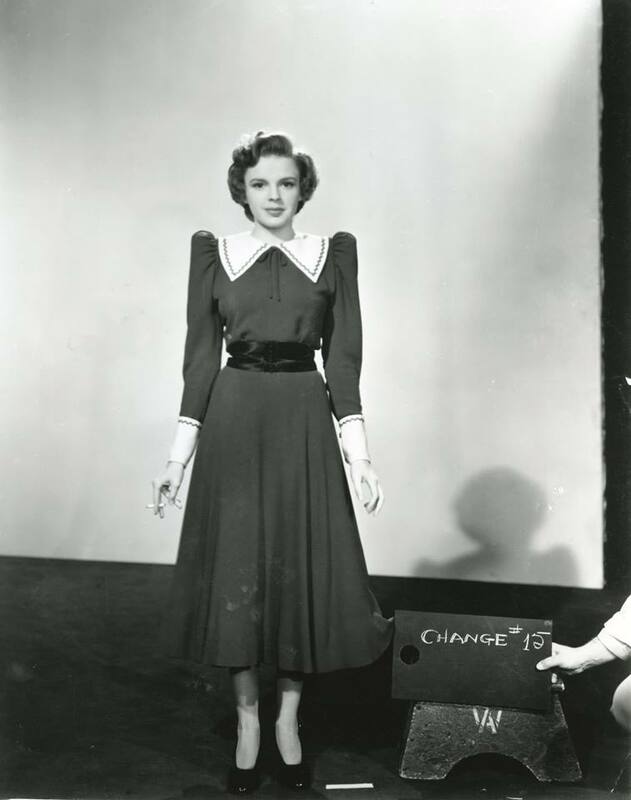 LEXINGTON, Ky., April 30 – Petite Judy Garland thinks either Native Dancer or Correspondent will win all the gold and glory in Saturday’s 79th Kentucky Derby. The talented actress’ opinion about the probable winner of The Run for the Roses jibes with that of most of the so-called turf experts. But the hardboots down here in this race-horse section would describe the singing star of the movies and entertainment world as being “better than a green hand” at picking hosses. Miss Garland appeared last night at huge Memorial Coliseum as one of the stars in the first of the two shows sponsored by Blue Grass Festivals, Incorporated. The new organization plans to bring top-flight entertainment to Lexington as an attraction for Derby visitors and townfolk. The dark-haired singer, who isn’t one white over 5 feet tall, appeared with Vaughn Monroe, nationally known band leader, and other entertainers. Judy and her husband, Sid Luft, are house guests of Mrs. Edward S. Moore at nearby Circle M Farm. They will watch the running of the Derby from a vantage point in one of Mrs. Moore’s boxes. Outside of the charms of the Bluegrass countryside and the “oh, so very nice hospitality of all its people,” Judy likes best to talk about her husband’s plans to produce a film centered around the great Man o’ War. Luft spent some time today and will spend more later this week in looking over farms and countryside here as possible sites for scenes of his Man o’ War movie. Judy’s plans for the future? I’ll return to Hollywood sometime in June to start work on a new picture, ‘A Star Is Born,’ which Sid and I will produce.” The story is a remake of the one in which Janet Gaynor starred. May 1, 1957: Judy returned to Las Vegas for a three-week engagement at the Flamingo Hotel. Her 90-minute act included “Lucky Day”; “How About Me?” (soon to be released on her new “Alone” album from Capitol Records); “Rock-a-Bye Your Baby”; “Mean To Me”; “By Myself”; “The Man That Got Away”; “Come Rain Or Come Shine”; “A Pretty Girl Milking Her Cow”; “A Couple of Swells”; and “Over The Rainbow.” Judy was joined by Sid Krofft & His Puppets, and she joked to the press that the puppets’ wardrobe cost more than hers, allegedly a $50,000 Balmain wardrobe. 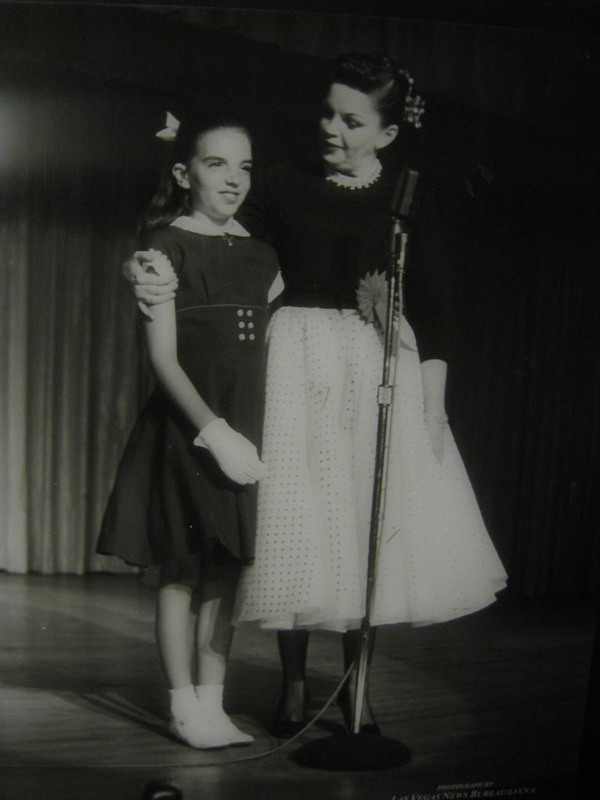 11-year-old Liza was part of the act on May 18th singing “In Between” and four-and-a-half old Lorna sang “Jingle Bells” (which was Judy’s official stage debut song at Christmas way back in 1924). 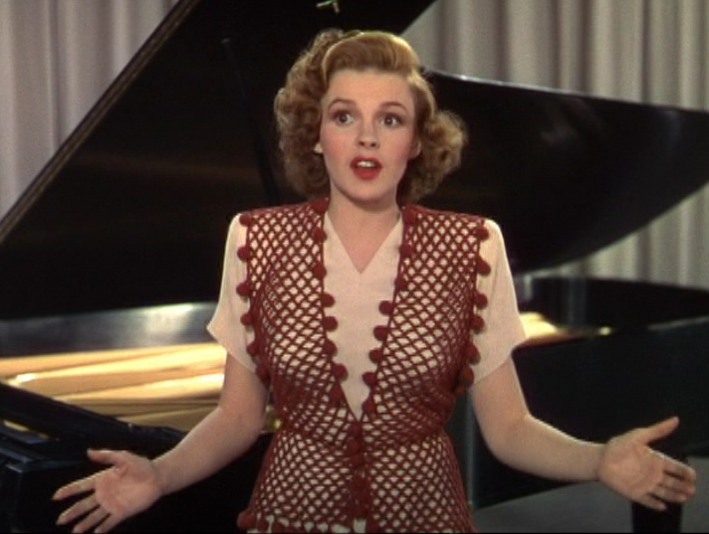 Louella Parsons reported in her column that the opening night audience surprised Judy: Judy Garland nearly fell apart when, as a tribute to her singing “Over the Rainbow,” the entire first-night audience at the Las Vegas Flamingo rose to its feet in the middle of the song and stood silently until she finished. 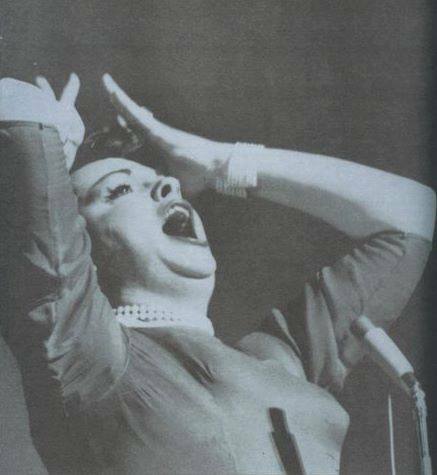 May 1, 1961: Judy fulfilled a prophecy.